The Alumni Network Viadrin@lumni is by no means first interesting after graduation. To the contrary, we have made it our priority to promote dialog and networking between current students and Viadrina alumni. The Academic Choir was formed in 2003. The choir's members are students enrolled at Viadrina European University and at the Collegium Polonicum. Barbara Weiser is the conductor. Rehearsals are held every Monday evening during the semester at 8:30 in the Collegium Polonicum's large auditorium. Die Amnesty International Regionalgruppe von Frankfurt (Oder) besteht aus Mitgliedern der Universität als auch aus der Stadt Frankfurt (Oder). Unser Themenschwerpunkt liegt auf der Beteiligung an Campagnen im Rahmen von ai international und die Durchführung von selbstständigen Informationsveranstaltungen zum Thema Menschenrechtsverletzungen. The student club Basswood7 was founded in 2011 by the initative Nachtleben e.V.. 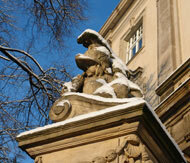 It organizes parties for all students and is a meeting place for Viadrina´s organizations and student initiatives. The club is kept in a simple black and white dseign and offers a wide variety of alcoholic beverages at affordable prices. The Bundesverband deutscher Volks- und Betriebswirte (Federal Association of Management Experts and Political Economists) is a national network of economists, for economists. Our chapter has made it a priority to publicize this association internationally. For Viadrina students, we offer "Meet the Prof.", an event held up to twice each semester, where students can become familiar with the faculty. In addition, we organize excursions with factory visits and cultural components. The Debate Club debates according to the OPD rules with the purpose of preparing ourselves for debate competitions across Germany; furthermore, we strive to constantly improve our public speaking and rhetorical skills. We meet every Monday evening at 6:00 in room 162 of the main university building (HG 162). All interested students are cordially invited to attend and participate. GFPS is a student organization that promotes understanding in Central and Eastern Europe. As the Frankfurt (Oder) chapter, we make our organization known and promote projects locally such as parties, tandem events, and seminars. Our weekly Stammtisch is one regular gathering, which is held every Monday evening at 8:00. Locations change regularly. Members of the Institut für angewandte Geschichte (Institute for Applied History), which are students and graduates of Viadrina, use projects, excursions and seminars to address issues of the border region and its residents. Through its work, the institute creates a link between the university and the Frankfurt (Oder)-Slubice region, between the present and the past. Interstudis exists to assist guest students at Viadrina. In addition to organizing events and excursions to aid guest students in meeting one another and their peers at Viadrina, we provide each guest student with a personal tutor. Become one of us! We are looking forward to our continued growth. The JU Hochschulgruppe (Youth CDU/CSU Organization) has developed into a stable presence in StuPa over the past several years. We stand for positive changes in student life, efficiency in student government, and we support meaningful projects of the student body. Kunstgriff is the hub in a network for the university, Slubice, Frankfurt (Oder) and the region, lobbyist for art and culture at Viadrina as well as enabler for cultural projects of all forms. Some of the resources that we currently offer are: contacts and coordination, fundraising assistance (i.e. common application for aid and grants), financing of three choir/orchestra conductors, rehearsal space (forthcoming) and hardware (amplifiers, music stands, sound boards and the like are available on loan--no fee, but a deposit is required). We look forward to all who would like to join us! Liberal Campus (LiCa) is an organization comprised of students from every field of study. What unites us is our interest in university happenings and the desire to organize them according to our own visions. We do not align ourselves with an single party platform, but rather develop our ideas independently to achieve our goals. Ostblick e.V. – RegionalInitiative OsteuropaStudierender Berlin-Brandenburg is an association of students, phd-students and alumni of the four universities in Berlin and Brandenburg where you can study subjects or courses of studies related to Eastern Europe. We organize various projects and events concerning cultural, social and political topics related to Central and Eastern Europe. One example is our student guide “Studying Eastern Europe in Berlin and Brandenburg” which presents all relevant information about subjects and courses of study concerning Eastern Europe at the universities in Berlin and Brandenburg. Furthermore, every first Wednesday a month we organize our Ostblick-meeting at different places in Berlin and Brandenburg open for everyone who wants to socialize and talk about Eastern European topics. The Viadrina Consulting Group e.V. (VCG) has become one of the largest initiatives at Viadrina in terms of membership (currently 60 members) since its founding in 2002. We no longer only advise small and medium-sized enterprises (SME) from the region, but our client base has expanded and currently includes enterprises from across Germany and Poland. Our offerings to organizations include various services in the areas of marketing, strategy and IT--from market research, to SWOT-Analysis and establishment of an internet presence. In addition to external projects, VCG organizes public lectures, training sessions and workshops at the university. Through its multifaceted fields of expertise, VCG offers interested students of all fields and semesters of study the opportunity to gain extensive experience and turn their theoretical knowledge into practice. ViaMUN is Viadrina's Model UN group. We have made it our goal to impart the students and citizens of Frankfurt (Oder) with a differentiated view of the United Nations. To achieve this goal, we organize events including the annual "Viadrina Model United Nations", in which we simulate the work of UN committees in a type of mock convention. The goal of Viasion Medien&Kunst is to discover and fully develop the artistic and creative potential of its members and participants by means of projects and workshops. For this reason, the club is actively involved in the areas of photography, film and text production. The University Orchestra "Viaphoniker" is always looking for instrumental support (pun intended!). Rehearsals are held once weekly during the semester. Musicians with orchestra experience are welcome to join us! The current rehearsal time is 7:00-10:00 every Tuesday evening in Room 03 of the Audimax building. Vivadrina is the European University’s only independent magazine made by students, reporting on topics regarding the university, Frankfurt/Słubice and far beyond. What all contributions have in common however is that they matter, to students and all those who feel in some way or another connected to university life. We see it as our task to draw our readers’ attention to matters that our contributors think ought to be addressed or discussed in a ever changing mixture of both serious journalism and fun.